MachineGames and publisher Bethesda have not been shy showing off Wolfenstein: The Old Blood. We've already seen heaps of footage, but now there's another lengthy video showcasing the standalone expansion. The game releases this week so it might be worth avoiding this if you're keen to be surprised, but if you're impatient or just wanna watch the world burn, the video is above. 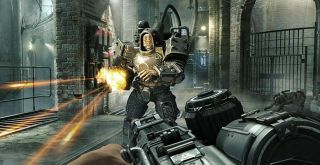 Reported to have a more "pulpy, B-movie vibe" than its serious older sibling The New Order, The Old Blood will take place across eight chapters, and is expected to be punishingly difficult on its hardest setting (a redundant observation for anyone brave enough to play The New Order on its hardest difficulty). It's due to release on May 6 and will require similar system specs to The New Order.